The astronomical unit (symbol: au, ua, or AU) is a unit of length, roughly the distance from Earth to the Sun. However, that distance varies as Earth orbits the Sun, from a maximum (aphelion) to a minimum (perihelion) and back again once a year. Originally conceived as the average of Earth's aphelion and perihelion, since 2012 it has been defined as exactly 7011149597870700000♠149597870700 metres, or about 150 million kilometres (93 million miles). The astronomical unit is used primarily for measuring distances within the Solar System or around other stars. It is also a fundamental component in the definition of another unit of astronomical length, the parsec. A variety of unit symbols and abbreviations have been in use for the astronomical unit. In a 1976 resolution, the International Astronomical Union (IAU) used the symbol A to denote a length equal to the astronomical unit. In the astronomical literature, the symbol AU was (and remains) common. In 2006, the International Bureau of Weights and Measures (BIPM) recommended ua as the symbol for the unit. In the non-normative Annex C to ISO 80000-3 (2006), the symbol of the astronomical unit is "ua". In 2012, the IAU, noting "that various symbols are presently in use for the astronomical unit", recommended the use of the symbol "au". In the 2014 revision of the SI Brochure, the BIPM used the unit symbol "au". Earth's orbit around the Sun is an ellipse. The semi-major axis of this elliptic orbit is defined to be half of the straight line segment that joins the perihelion and aphelion. The centre of the Sun lies on this straight line segment, but not at its midpoint. Because ellipses are well-understood shapes, measuring the points of its extremes defined the exact shape mathematically, and made possible calculations for the entire orbit as well as predictions based on observation. In addition, it mapped out exactly the largest straight-line distance that Earth traverses over the course of a year, defining times and places for observing the largest parallax (apparent shifts of position) in nearby stars. Knowing Earth's shift and a star's shift enabled the star's distance to be calculated. But all measurements are subject to some degree of error or uncertainty, and the uncertainties in the length of the astronomical unit only increased uncertainties in the stellar distances. Improvements in precision have always been a key to improving astronomical understanding. Throughout the twentieth century, measurements became increasingly precise and sophisticated, and ever more dependent on accurate observation of the effects described by Einstein's theory of relativity and upon the mathematical tools it used. Improving measurements were continually checked and cross-checked by means of improved understanding of the laws of celestial mechanics, which govern the motions of objects in space. The expected positions and distances of objects at an established time are calculated (in AU) from these laws, and assembled into a collection of data called an ephemeris. NASA's Jet Propulsion Laboratory HORIZONS System provides one of several ephemeris computation services. In 1976, in order to establish a yet more precise measure for the astronomical unit, the IAU formally adopted a new definition. Although directly based on the then-best available observational measurements, the definition was recast in terms of the then-best mathematical derivations from celestial mechanics and planetary ephemerides. It stated that "the astronomical unit of length is that length (A) for which the Gaussian gravitational constant (k) takes the value 6998172020989500000♠0.01720209895 when the units of measurement are the astronomical units of length, mass and time". Equivalently, by this definition, one AU is "the radius of an unperturbed circular Newtonian orbit about the sun of a particle having infinitesimal mass, moving with an angular frequency of 6998172020989500000♠0.01720209895 radians per day"; or alternatively that length for which the heliocentric gravitational constant (the product GM☉) is equal to (6998172020989500000♠0.01720209895)2 AU3/d2, when the length is used to describe the positions of objects in the Solar System. Subsequent explorations of the Solar System by space probes made it possible to obtain precise measurements of the relative positions of the inner planets and other objects by means of radar and telemetry. As with all radar measurements, these rely on measuring the time taken for photons to be reflected from an object. Because all photons move at the speed of light in vacuum, a fundamental constant of the universe, the distance of an object from the probe is calculated as the product of the speed of light and the measured time. However, for precision the calculations require adjustment for things such as the motions of the probe and object while the photons are transiting. In addition, the measurement of the time itself must be translated to a standard scale that accounts for relativistic time dilation. Comparison of the ephemeris positions with time measurements expressed in the TDB scale leads to a value for the speed of light in astronomical units per day (of 7004864000000000000♠86400 s). By 2009, the IAU had updated its standard measures to reflect improvements, and calculated the speed of light at 7008299792458018110♠173.1446326847(69) AU/d (TDB). In 1983, the International Committee for Weights and Measures (CIPM) modified the International System of Units (SI, or "modern" metric system) to make the metre defined as the distance travelled in a vacuum by light in 1/299792458 second. This replaced the previous definition, valid between 1960 and 1983, which was that the metre equalled a certain number of wavelengths of a certain emission line of krypton-86. (The reason for the change was an improved method of measuring the speed of light.) The speed of light could then be expressed exactly as c0 = 7008299792458000000♠299792458 m/s, a standard also adopted by the IERS numerical standards. From this definition and the 2009 IAU standard, the time for light to traverse an AU is found to be τA = 7002499004783806100♠499.0047838061±0.00000001 s, which is slightly more than 8 minutes 19 seconds. By multiplication, the best IAU 2009 estimate was A = c0τA = 7011149597870700000♠149597870700±3 m, based on a comparison of JPL and IAA–RAS ephemerides. In 2006, the BIPM reported a value of the astronomical unit as 7011149597870691000♠1.49597870691(6)×1011 m. In the 2014 revision of the SI Brochure, the BIPM recognised the IAU's 2012 redefinition of the astronomical unit as 7011149597870700000♠149597870700 m. or an increase of 9 meters. This definition makes the speed of light, defined as exactly 7008299792458000000♠299792458 m/s, equal to exactly 7008299792458000000♠299792458 × 7004864000000000000♠86400 ÷ 7011149597870700000♠149597870700 or about 7002173144632674240♠173.144632674240 AU/d, some 60 parts per trillion less than the 2009 estimate. With the definitions used before 2012, the astronomical unit was dependent on the heliocentric gravitational constant, that is the product of the gravitational constant G and the solar mass M☉. Neither G nor M☉ can be measured to high accuracy separately, but the value of their product is known very precisely from observing the relative positions of planets (Kepler's Third Law expressed in terms of Newtonian gravitation). Only the product is required to calculate planetary positions for an ephemeris, so ephemerides are calculated in astronomical units and not in SI units. The metre is defined to be a unit of proper length, but the SI definition does not specify the metric tensor to be used in determining it. Indeed, the International Committee for Weights and Measures (CIPM) notes that "its definition applies only within a spatial extent sufficiently small that the effects of the non-uniformity of the gravitational field can be ignored". As such, the metre is undefined for the purposes of measuring distances within the Solar System. The 1976 definition of the astronomical unit was incomplete because it did not specify the frame of reference in which time is to be measured, but proved practical for the calculation of ephemerides: a fuller definition that is consistent with general relativity was proposed, and "vigorous debate" ensued until August 2012 when the IAU adopted the current definition of 1 astronomical unit = 7011149597870700000♠149597870700 metres. 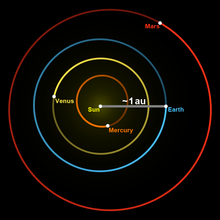 The astronomical unit is typically used for stellar system scale distances, such as the size of a protostellar disk or the heliocentric distance of an asteroid, whereas other units are used for other distances in astronomy. The astronomical unit is too small to be convenient for interstellar distances, where the parsec and light-year are widely used. The parsec (parallax arcsecond) is defined in terms of the astronomical unit, being the distance of an object with a parallax of 1 arcsecond. The light-year is often used in popular works, but is not an approved non-SI unit and is rarely used by professional astronomers. When simulating a numerical model of the Solar System, the astronomical unit provides an appropriate scale that minimizes (overflow, underflow and truncation) errors in floating point calculations. The book On the Sizes and Distances of the Sun and Moon, which has long been ascribed to Aristarchus, says that he calculated the distance to the Sun to be between 18 and 20 times the distance to the Moon, whereas the true ratio is about 389.174. The latter estimate was based on the angle between the half moon and the Sun, which he estimated as 87° (the true value being close to 89.853°). Depending on the distance that Van Helden assumes Aristarchus used for the distance to the Moon, his calculated distance to the Sun would fall between 380 and 7003152000000000000♠1520 Earth radii. According to Eusebius of Caesarea in the Praeparatio Evangelica (Book XV, Chapter 53), Eratosthenes found the distance to the Sun to be "σταδιων μυριαδας τετρακοσιας και οκτωκισμυριας" (literally "of stadia myriads 400 and 7004800000000000000♠80000") but with the additional note that in the Greek text the grammatical agreement is between myriads (not stadia) on the one hand and both 400 and 7004800000000000000♠80000 on the other, as in Greek, unlike English, all three (or all four if one were to include stadia) words are inflected. This has been translated either as 7006408000000000000♠4080000 stadia (1903 translation by Edwin Hamilton Gifford), or as 7008804000000000000♠804000000 stadia (edition of des Places", dated 1974–1991). Using the Greek stadium of 185 to 190 metres, the former translation comes to 7008754800000000000♠754800 km to 7008775200000000000♠775200 km, which is far too low, whereas the second translation comes to 148.7 to 152.8 million kilometres (accurate within 2%). Hipparchus also gave an estimate of the distance of Earth from the Sun, quoted by Pappus as equal to 490 Earth radii. According to the conjectural reconstructions of Noel Swerdlow and G. J. Toomer, this was derived from his assumption of a "least perceptible" solar parallax of 7 arc minutes. In the 2nd century CE, Ptolemy estimated the mean distance of the Sun as 7003121000000000000♠1210 times Earth's radius. 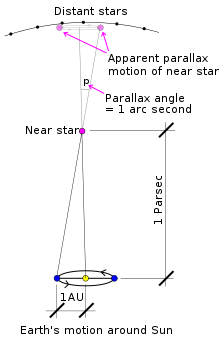 To determine this value, Ptolemy started by measuring the Moon's parallax, finding what amounted to a horizontal lunar parallax of 1° 26′, which was much too large. He then derived a maximum lunar distance of 64 1/6 Earth radii. Because of cancelling errors in his parallax figure, his theory of the Moon's orbit, and other factors, this figure was approximately correct. He then measured the apparent sizes of the Sun and the Moon and concluded that the apparent diameter of the Sun was equal to the apparent diameter of the Moon at the Moon's greatest distance, and from records of lunar eclipses, he estimated this apparent diameter, as well as the apparent diameter of the shadow cone of Earth traversed by the Moon during a lunar eclipse. Given these data, the distance of the Sun from Earth can be trigonometrically computed to be 7003121000000000000♠1210 Earth radii. This gives a ratio of solar to lunar distance of approximately 19, matching Aristarchus's figure. Although Ptolemy's procedure is theoretically workable, it is very sensitive to small changes in the data, so much so that changing a measurement by a few percent can make the solar distance infinite. Jean Richer and Giovanni Domenico Cassini measured the parallax of Mars between Paris and Cayenne in French Guiana when Mars was at its closest to Earth in 1672. They arrived at a figure for the solar parallax of 9 1/2", equivalent to an Earth–Sun distance of about 7004220000000000000♠22000 Earth radii. They were also the first astronomers to have access to an accurate and reliable value for the radius of Earth, which had been measured by their colleague Jean Picard in 1669 as 7003326900000000000♠3269 thousand toises. Another colleague, Ole Rømer, discovered the finite speed of light in 1676: the speed was so great that it was usually quoted as the time required for light to travel from the Sun to the Earth, or "light time per unit distance", a convention that is still followed by astronomers today. A better method for observing Venus transits was devised by James Gregory and published in his Optica Promata (1663). It was strongly advocated by Edmond Halley and was applied to the transits of Venus observed in 1761 and 1769, and then again in 1874 and 1882. Transits of Venus occur in pairs, but less than one pair every century, and observing the transits in 1761 and 1769 was an unprecedented international scientific operation including observations by James Cook and Charles Green from Tahiti. Despite the Seven Years' War, dozens of astronomers were dispatched to observing points around the world at great expense and personal danger: several of them died in the endeavour. The various results were collated by Jérôme Lalande to give a figure for the solar parallax of 8.6″. The measurements of the secular variations of the astronomical unit are not confirmed by other authors and are quite controversial. Furthermore, since 2010, the astronomical unit has not been estimated by the planetary ephemerides. ^ a b RESOLUTION B2 on the re-definition of the astronomical unit of length (PDF), Beijing, China: International Astronomical Union, 31 August 2012, The XXVIII General Assembly of International Astronomical Union … recommends … 5. that the unique symbol "au" be used for the astronomical unit. ^ "Monthly Notices of the Royal Astronomical Society: Instructions for Authors". Oxford Journals. Retrieved 20 March 2015. The units of length/distance are Å, nm, µm, mm, cm, m, km, au, light-year, pc. ^ a b "Manuscript Preparation: AJ & ApJ Author Instructions". American Astronomical Society. Retrieved 29 October 2016. Use standard abbreviations for SI... and natural units (e.g., au, pc, cm). ^ a b "SI Brochure: The International System of Units (SI) [8th edition, 2006; updated in 2014]". BIPM. 2014. Retrieved 3 January 2015. ^ "Selected Astronomical Constants" (PDF). The Astronomical Almanac Online. USNO–UKHO. 2009. p. K6. Archived from the original (PDF) on 26 July 2014. ^ Richard Dodd (2011), "§ 6.2.3: Astronomical unit: Definition of the astronomical unit, future versions", Using SI Units in Astronomy, Cambridge University Press, p. 76, ISBN 978-0-521-76917-4 and also p. 91, Summary and recommendations. ^ John D. Anderson & Michael Martin Nieto (2009), "Astrometric Solar-System Anomalies;§ 2: Increase in the astronomical unit", American Astronomical Society, 261: 189–97, arXiv:0907.2469, Bibcode:2009IAU...261.0702A, doi:10.1017/s1743921309990378. ^ Alan Stern; Colwell, Joshua E. (1997), "Collisional Erosion in the Primordial Edgeworth-Kuiper Belt and the Generation of the 30–50 AU Kuiper Gap", The Astrophysical Journal, 490 (2): 879–82, Bibcode:1997ApJ...490..879S, doi:10.1086/304912.